(c) Confirm that the front tires face straight forward. (d) Engage the 3 claws and install the spiral cable sub-assembly with sensor. 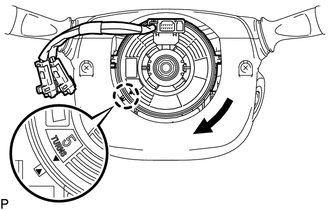 When replacing the spiral cable sub-assembly with sensor with a new one, remove the lock pin before installing the steering wheel. (e) Connect the connectors to the spiral cable sub-assembly with sensor. (a) Rotate the spiral cable sub-assembly with sensor counterclockwise slowly by hand until it feels firm. 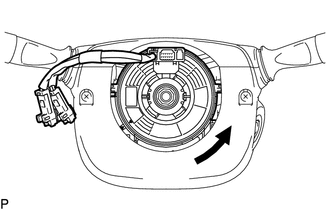 Do not turn the spiral cable sub-assembly with sensor by the airbag wire harness. (b) Rotate the spiral cable sub-assembly with sensor clockwise approximately 2.5 turns to align the marks. The spiral cable sub-assembly withy sensor will rotate approximately 2.5 turns to both the left and right from the center.